Wedding signage has become a great love of mine. 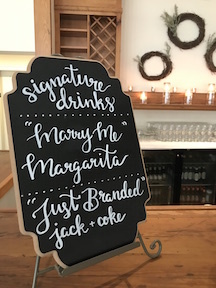 I’m able to create welcome signs, Stevenson Ridge’s signature buffet sign, and signature drinks signs for the bar for each wedding. With that being said, I do think there is a fine line between complimenting your wedding with a well-done calligraphy sign and overkill ending with too much to read. Signs are beneficial and necessary as long as they impart information that adults can’t figure out themselves. “Please sign the guest book” typically is a must because it’s something you want your guests to do and they may be looking for permission to sign whatever creative idea you came up with for your guest book (puzzles, matted picture, etc.) But directives should be kept to a minimum. Take it from me, sometimes less is best. 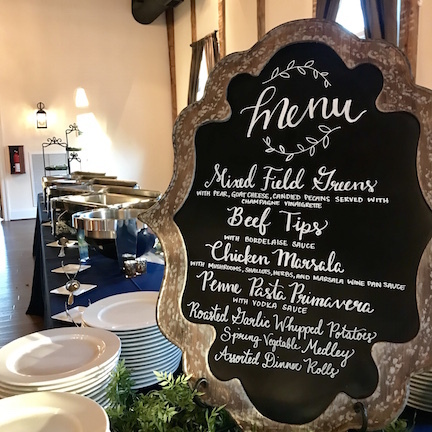 Work with your wedding coordinator to come up with the best signage plan that works for you AND your guests—without making them work too much!